Whether you're visiting Suffolk for the first time or are a frequent visitor it's good to know where you can go with your pets. 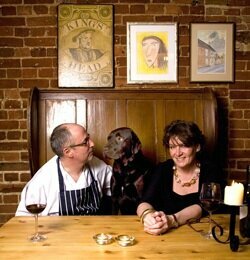 Suffolk has a range of Pet Friendly Hotels from coast to town, luxury hotels to value accommodation. While all Hotels will request that you keep your pets away from the Restaurant (this isn't France after all), many allow pets in the bedrooms, so bring Mutley with you on your Suffolk holiday. Listed in The Good Hotel Guide 2017 another excellent coastal pub with heath walks and beaches on the doorstep, The Ship Inn at Dunwich provide a warm welcome for dogs (we hear there are even biscuits!) They have 16 elegant rooms, some are pet friendly and pooches can accompany you to your meal in the bar, conservatory or dining room. The meals are traditional and delicious - steak and ale pie, lamb, pea and mint casserole etc and in the summer months, can be enjoyed in the enormous garden along with a pint of locally brewed Adnams. 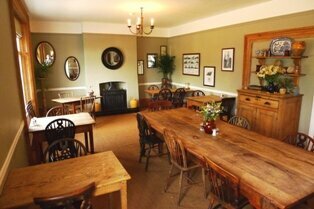 See the The Ship Inn, Dunwich for details of special offers and contact info. 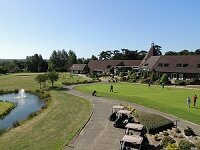 Set in acres of lovely Suffolk countryside near Woodbridge, Ufford Park Hotel, Golf & Spa will suit dog and owner just fine! Well behaved dogs are allowed on a lead, so they don't go chasing the balls on the golf course! Their owners can enjoy a round, or be pampered with one of the many spa treatments. With reasonable room rates, Ufford Park also makes a great base from which to explore the many sights and attractions (and walks!) that Suffolk has to offer. Treat Mutley to a bit of luxury at this country house hotel, with 23 stylish rooms - some dog friendly, Kesgrave Hall offers plenty of space for dogs to stretch their legs. They are allowed on the terrace but not in the bar or restaurant however takeaway breakfast can be ordered and eaten in your room and they also offer doggy goody bags (lucky boy). 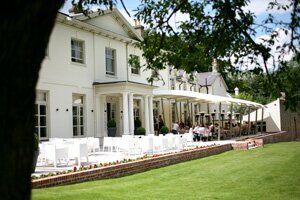 Tucked away in Kesgrave near Ipswich, this stylish yet friendly hotel also welcomes children with a children menu on offer all day. Click the link above to find out more. On the River Alde just south of Aldeburgh in the picturesque village of Orford, you will find The Crown and Castle. The owners, David and Ruth Watson (the original hotel inspector) and Tim Sunderland have used their wealth of experience to create a stylish yet friendly independent Boutique Hotel which is dog friendly. Some of their 21 bright and stylish are dedicated to your and your dog. Orford is a great choice for a holiday or short break with the dog as there are many country walks and coastal paths to enjoy, and, as Orford is a great foodie town with a fabulous bakery and several food led pubs plus the world famous Butley Oyster Restaurant, you can work up a good appetite here. A bit further up the Suffolk Coast at Aldeburgh The Brudenell Hotel allows dogs providing they are well behaved and kept on a lead. They will love being so close to the sea and the pebble beach offers plenty of stones to throw for them to chase. The Bru is a family friendly hotel so your dog might have plenty of children to play with too. There is also a great Seafood and Grill restaurant and a lovely terrace overlooking the sea in the summer. 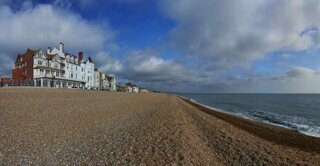 The Wentworth Hotel, Aldeburgh is also close to the beach, ideal for taking your dog for a walk to the Fish Shack. The sea-facing terrace looks over great gardens, superb for al fresco dining. The restaurant has been awarded a AA Rosette and this comfortable hotel puts on a roaring fire to warm up after a bracing walk. Click on their link above for full details. Another coastal delight is The Anchor at Walberswick. Close to the famous beach and boasting a lovely beer garden, award winning food and an impressive selection of local ales and fine wines, the Anchor is a must on any dog and owners list. This foodie pub champions local produce and dogs are allowed on the outside terraces and in the three dog friendly chalets. Click the link above for more information. Hintlesham Hall Close to a lovely village Hintlesham Hall boasts a golf course, spa treatments, a wonderful restaurant with luxury rooms to stay in. 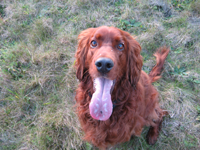 Dogs are welcome on a lead, and an extra charge is made for an overnight stay. Just ask when you book where you are allowed to take your dog. The Kings Head in Orford, a traditional and cosy Suffolk Inn, with a good selection of home cooked food and a well stocked bar, including the local Adnams of course! Four enuite rooms and weekly food specials and events,visit the link above to find out more. or Dog Friendly Beaches in Suffolk.